No need to spend your precious vacation time waiting in line. 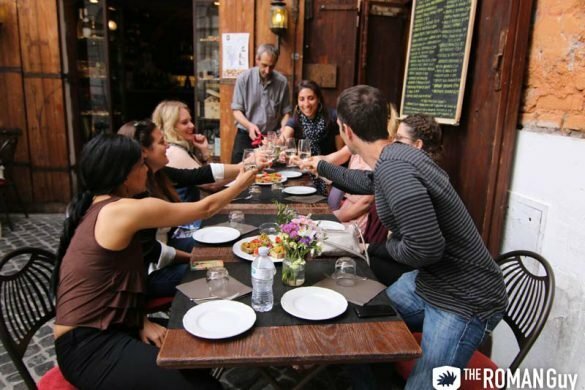 Our selection of Florence tours offers something for everyone, from skip the line experiences to foodie adventures. 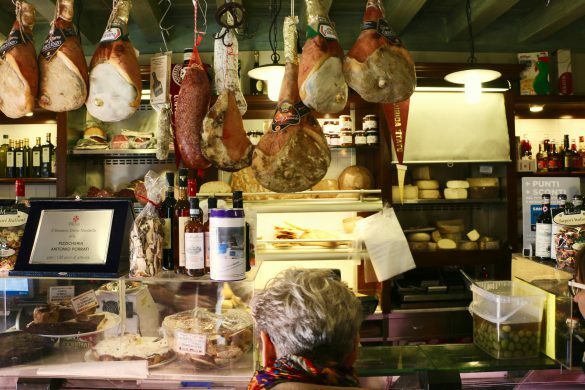 Make sure to ask your guide about all of the hidden gems in Florence as well. 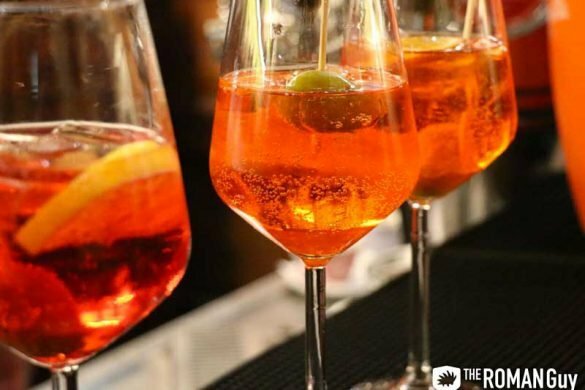 If you search anything about Florence online, you are bound to see a landscape image of beautiful, red-roofed buildings with an enormous dome dominating the horizon. Postcards, posters, magnets, and brochures boast the same image. What is it? It is the Florence Duomo and it is a part of the Cathedral of Santa Maria del Fiore. Funnily enough, the dome, designed by Filippo Brunelleschi, wasn’t added to the church until the 15th century, a whole 2 centuries after the church construction began. It still remains the largest brick dome ever constructed, while the church stands as the 4th largest in the world. Don’t let the dome take away all of your attention. As you set your sights a bit lower, you’ll notice that the church’s facade is completely made up of stunning green, pink, and white marble panels. The interior reflects the typical Gothic style and uniquely houses 44 stained glass windows. 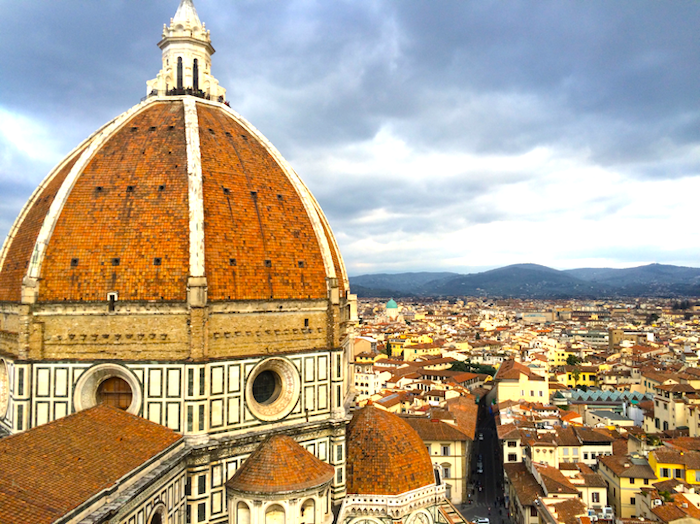 As you wander through the vast, seemingly bare aisles, view The Last Judgment by Giorgio Vasari and other unique Italian style frescoes, or climb the nearby Giotto’s bell tower to get a terrific view of Florence from above. 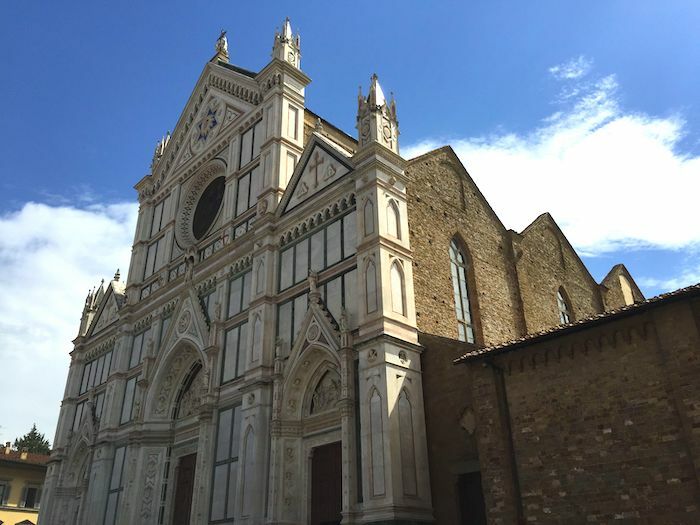 Although you might pass it on your way from the train station, the Gothic church of Santa Maria Novella is a must-see for anyone enjoying the beauty of Florence. It was known as the first great basilica in Florence, and remains the principal Dominican church today, as it was built by Dominican friars. Interestingly, the upper and lower parts of the church were created separately. Fra Iacopo Talenti da Nipozzano designed the lower Romanesque marble facade, which was finished around 1360. Leon Battista Alberti designed the upper part, which was finished 100 years later. Talk about a work in progress! The church and its surrounding buildings include many treasured artifacts like Masaccio’s Trinità. Go inside and check out Giotto’s Crucifix if you want to see the hauntingly beautiful, yet disturbing representation of Christ’s death. Or if you’re in the mood for a more uplifting image of Christianity, view one of Botticelli’s earliest works, the Nativity scene above the main door inside. What does a set of sixteen chapels, Gaddi’s frescoes of The Legend of the True Cross, and an infamous bell tower that remained incomplete for centuries all have in common? Well, the Basilica of Santa Croce of course! You can see all of those features up close and personal at the largest Franciscan church in the world. However, what truly sets this 13th and 14th century Gothic style basilica apart from all the others is that the bones of some of the most distinguished Italians of all time lie within it. 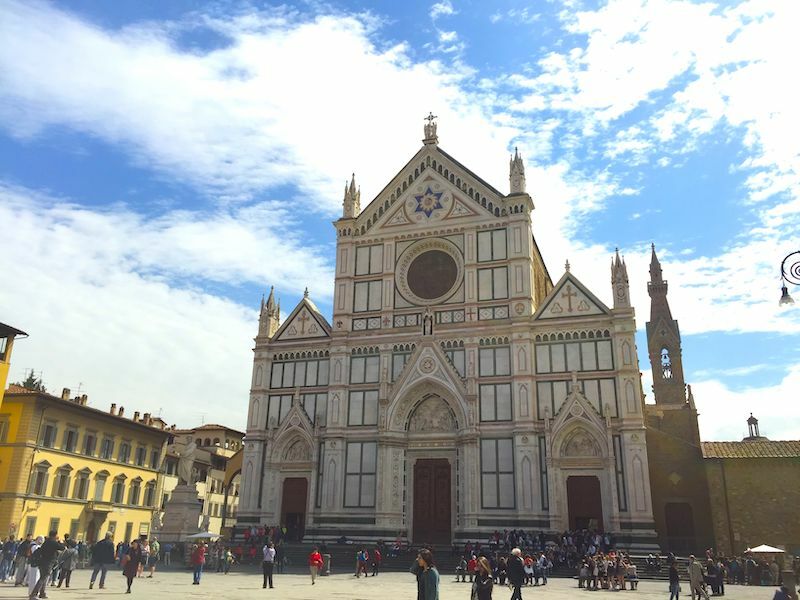 The tombs of Michelangelo, Galileo, Machiavelli, Foscolo, and Rossini make Santa Croce the Temple of Italian Glories, adding to its allure and mystique. As for its design, the Egyptian cross style floor plan takes you on a frescoed narration of Christ, well-known saints, and St. Francis, who legend says founded the church. Although many repairs and renovations took place due to a flooding of the Arno River in 1966, you can still see the treasured artifacts and give honor to those illustrious Italians who shaped the art world as we know it. 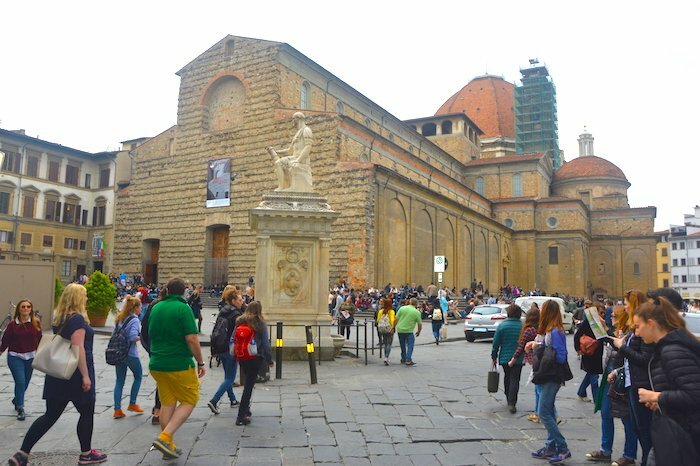 While you are touring around Florence, you will hear the name Medici over and over again. The Medici family was one of the most powerful families in Florence because they ruled during the 13th and 14th centuries. 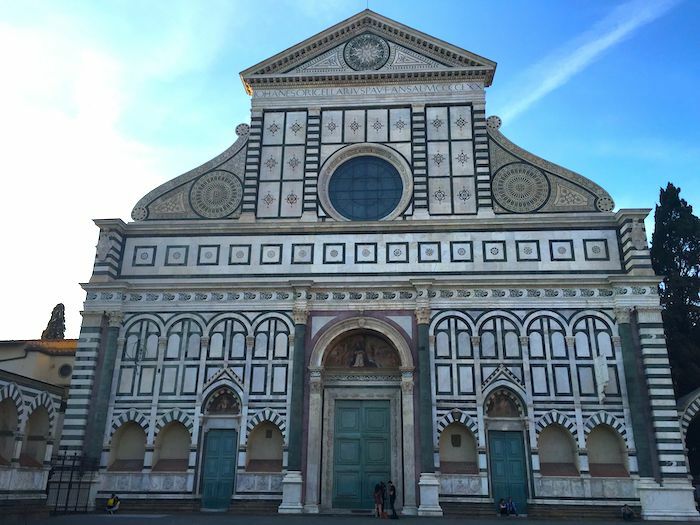 The Basilica of San Lorenzo is a highlight of Florence because not only was this church partially funded by the Medici family, but it was also chosen as the burial grounds for them. 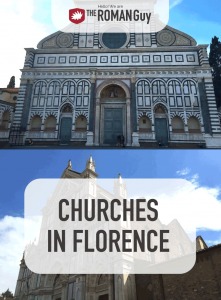 The church is also believed to be one of the oldest churches in Florence as its consecration dates back to the year 393 A.D. In the early 15th century, renowned architect Filippo Brunelleschi was commissioned to create a more Romanesque style design; however, the new construction wasn’t completed until after his death. There is some cloudiness and mystery surrounding who actually finished the job, and the ending product astounds as it is completely different than the original design. It’s new style features the integration of pietra serena, or dark stone, and an emphasis on creating proportional relationships between elements. Wander among the spirits of royalty and enjoy the unique style of this interesting basilica. If you are looking for the most breathtaking panoramic view of Florence, you need to visit San Miniato al Monte whose name befits its location (al monte= on the mountain). Although it is a bit outside of the city, you can walk, take public transportation or drive to this stunning church. 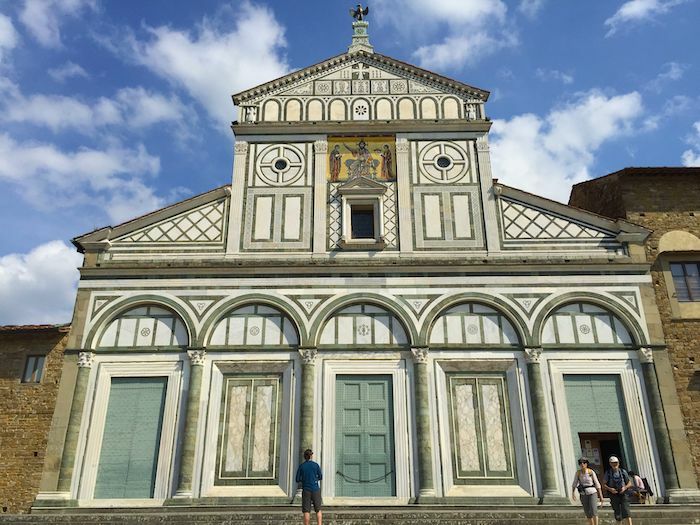 Built between the 11th and 13th centuries, San Miniato is a gorgeous representation of the Romanesque style and design. While the geometric marble façade looks similar to some of the other churches in Florence, the inside boasts a unique crypt, sanctuary, and an impressive chorus platform and pulpit. Michelozzo’s Cappella del Crocefisso draws your attention to the central nave and frescoes by Gaddi guide your wanderings down the aisles. Be sure to check out the monumental cemetery out back where Carlo Collodi, author of Pinocchio, sculptor Libero Andreotti, and politician Giovanni Spadolini are buried.